Do you need a specific manufacturer? Are you trying to color match?? Call us today as we now offer a variety of different brands!! Our most popular line of our exposed fastener metals is our Everlast II. Please click here for more detailed information. 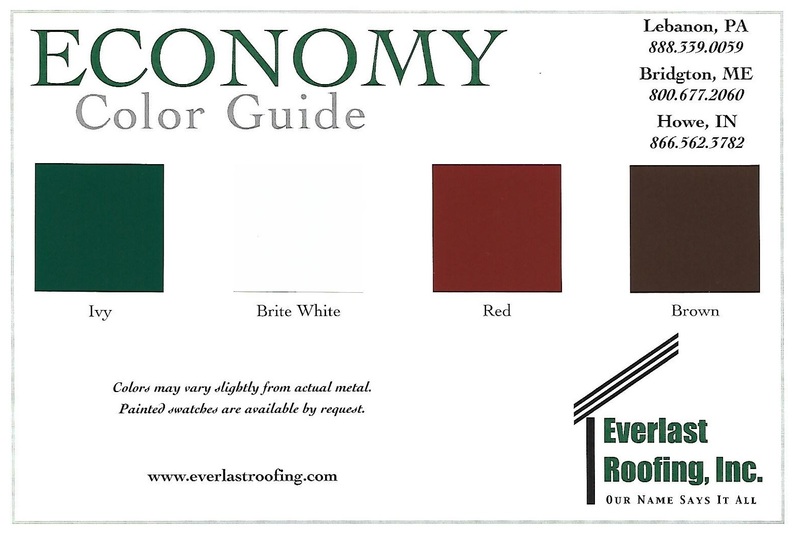 We offer our EverDrain line of metal roofing, similar to the Everlast line, but with 6" between major ribs that are 1/2" in height. This line is also available in our 27-gauge series (OMNI), 28-gauge series (LYNX), and for interior purposes available in our 29-gauge series (Economy). This line also offers the new series specifically for all agricultural needs (Galfan). You also have the option of getting this line in a bare galvalume or bare galvanized as well. Fabral's line comes in a 29 gauge bare galvanized and is recommended to be used with a minimum pitch of 2 1/2:12. 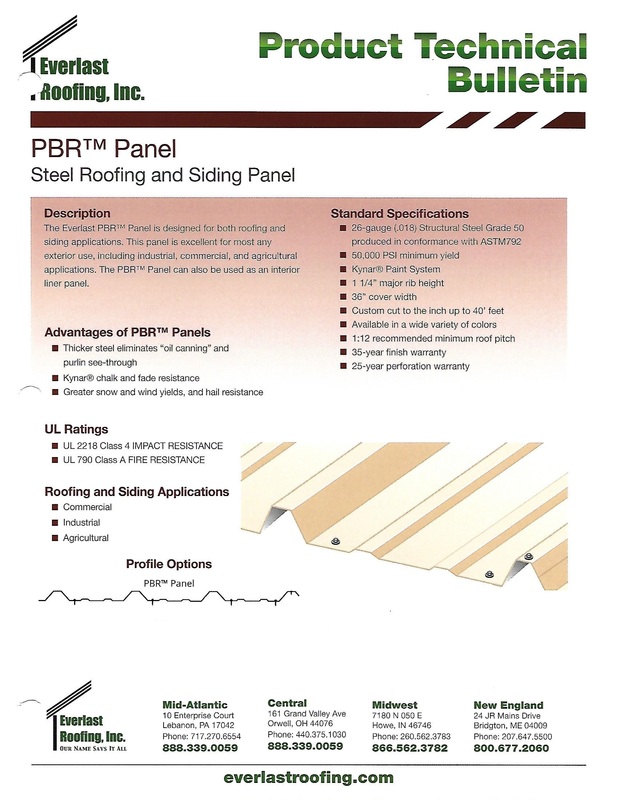 Just like Fabral's 1 1/4" panels, their 2 1/2" panels only come in 29 gauge bare galvanized with the same recommendations for pitch minimum (2 1/2:12). Union Corrugating's 2 1/2" panels come in the same gauge options as their 1 1/4" panels with an additional option of 24 gauge. These 2 1/2" corrugated panels now have the option of being painted in either the 29 gauge or the 26 gauge. All three gauges (29, 26 & 24) can come in bare galvalume, while the 29 gauge is the only one that can come bare galvanized. It is reccomended to be used with a minimum pitch of 3:12. The 5V panel, aka 5V crimp, comes with a 24" coverage width and a 1/2" rib height. This style also offers different options per company. Fabral's line comes in 29 gauge bare galvanized and is also recommended to be used on a minimum pitch of 2 1/2:12. This series is geared towards your industrial/commercial needs. These panels provide 36" of cover width with 12" between major ribs that measure 1 1/4" high. This series is for applications on roof pitches as low as 1:12. ﻿PBR﻿ comes in a 26-gauge either bare galvalume or a choice from over 5 colors; 24-gauge bare galvalume option also available. The "A" Panel series is similar to the PBR panel, just a different profile. This series is made for siding only due to the minor ribs being raised rather than the major ribs. This series is also ideal for applications on roof pitches as low as 1:12. These panels also come in a 26-gauge either bare galvalume or painted with the option of a 24-gauge bare galvalume.